Though SunRock Solar is based in Blue Ash, Ohio–a suburb north of Cincinnati–we design and install renewable energy systems throughout southwest Ohio. We have completed projects in Oxford, Eaton, Tipp City, Kettering, Waynesville, and Yellow Springs. If you live in the greater Dayton area and are interested in learning more about solar for your home or business, give us a call. A few examples of our work in the greater Dayton area are described below. 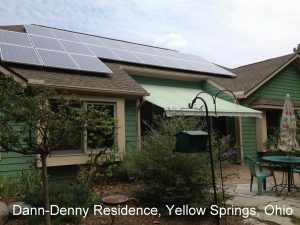 SunRock has performed several installations in Yellow Springs, including one this past year at the Dann-Denny residence (featured in this Yellow Springs News article). The 5.2 kW solar PV installation was designed to provide about 80% of the couple’s modest electricity needs. At ages 94 and 79, the couple was particularly interested in leaving a legacy for the future. SunRock installed a solar power system on the roof of a home in Kettering back in 2010 (photo here). In 2011, the roof was severely damaged in a hail storm and had to be replaced. SunRock removed the PV modules (which were NOT damaged by the hail) to allow a new roof to be put on, and then reinstalled the panels. The system is back in production and producing electricity for the homeowner. A large farm and residence in Eaton was built with solar back in 2008. After several years on the property, the owners decided more energy was needed to meet the needs of the farm. In 2012, SunRock increased the capacity of the ground-mounted system to 31 kW (photo here). The owners are now considering the addition of a third solar power system to cover the electricity for a recreational cabin and pond aeration pumps. In 2011, customers in Tipp City were interested in solar electric for their home, but didn’t want anything on the front roof of their south-facing house. So SunRock installed a pole-mounted system in the backyard (). This pole-mounted system has the added benefit of being seasonally adjustable to match the changing angle of the sun. The solar PV system has provided 91% of their electricity in the last 12 months.